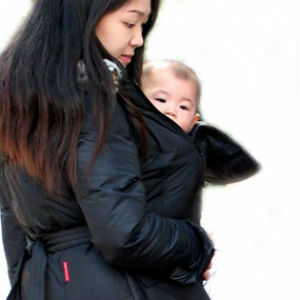 While the cooler months are a slow-season for carriers, I cannot think of a better way to keep warm than snuggling into a large coat with your baby comfortably resting against you- Talk about Nature’s Furnace! This year we’ve added a stellar selection of Mom-wear to our offerings; The MCoats, which are suitable for pregnancy, winter-weather carrying and yourself have been a huge hit. This Canadian-Made coat is down-filled- so cozy! The fabric is even Teflon-treated, to protect against the unavoidable spills as you sip your Hot Chocolate along the canal. Heck, this baby is even Machine-Washable! Which, from my perspective, is so important. They’re available now at our 1244 Wellington Street West location and come in a Black, Red, Navy and Brown. 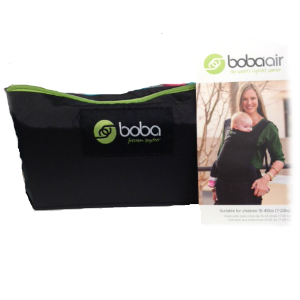 We’ve also just taken in our first order of Boba Air Carriers. Smaller than a wind-breaker jacket that folds into a fanny pack, these carriers are built for Travel! It can be used with a child who is between 15 and 45 pounds, but the carrier itself only weighs 0.7 pounds. Ideal for tucking into the suitcase as you visit family or escape to sun-soaked beaches this Winter. Will you be cuddling up this winter? Let us know the your fave ways to keep warm! 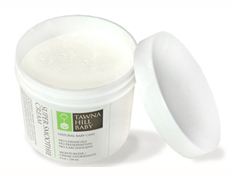 An interview with Tawna Hill, founder and creator of Tawna Hill Baby Natural Skin Care Products. FAB: Your story, Tawna, is amazing and inspiring. One thing in particular that you write on your website really struck me. You say of your daughter: “having battled through everything with me and ultimately (I feel) saving my life. I felt I owed it to her to be extremely safe about what I was going to use on her.” In what way do you feel that Olivia saved your life? Tawna: Good or bad, I’m of the belief that things happen for a reason – Olivia was a part of me when I was diagnosed, so she gave me the strength and power to face all of the treatments I (we) had to go through, she was like an incredible source of light within me, giving me the spirit to be brave, strong and to survive. She gave me the ultimate reason to live! FAB: Being a brain cancer survivor has clearly and drastically changed how you feel about chemical use in products that we use in or on our bodies. Can you give us a little insight into the perceived connection between the cancer you fought (and beat!!) and the lifestyle decisions we make on a daily basis? How did your experience with cancer and pregnancy lead you to create the Tawna Hill line? Tawna: It’s so clear that everyday products are chock full of chemicals and toxins, just by reading the labels and not knowing how to pronounce half of the words… Having worked in the beauty industry for 17+ years, I was always around these strange ingredient names. I really knew in my heart after experiencing my illness, that I wouldn’t be able to go back and promote items containing toxic ingredients. I also felt I was extremely lucky to have given birth to a healthy little girl and wanted to search out a way to shield her from toxins from the start. She clearly is my angel and I wanted to give her a life free of chemicals, as I was given a this incredible second chance. Now I definitely read every ingredient listing I encounter and make buying decisions much more wisely for my family and our future. FAB: Tawna Hill is different from some other “organic” skincare products. How so? Tawna: First of all, I have to say Tawna Hill Baby does not claim to be ‘organic’, I guess we could claim that if we felt it necessary, as we do have several ‘organic’ ingredients in each of our products. The laws are very loose on how things can be and are labelled… my belief is that if a product is labelled ‘organic’ or ‘natural’, every single ingredient in the product should be ‘organic’ or ‘natural’. 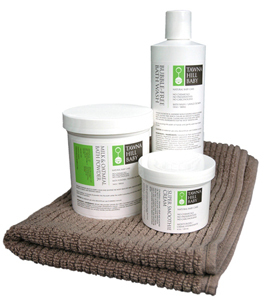 We are a Natural safe luxury baby skin care line. No Chemicals, No Preservatives, No Carcinogens. FAB: At Fab Baby Gear we notice that your labeling is particularly clear and easy to read and understand. Why was it so important for you to use ingredients that are familiar and uncomplicated? Tawna: Thank you for saying that! I think it’s important when looking for any product, that you should be able to make sense of the label as soon as you pick it up. Once again, ingredients should be reader friendly. I know every ingredient we have chosen is natural and toxin free, for the sake of parents who care about what they use on their babies. Parents shouldn’t need to have to have a scientific degree when searching for products for their family. FAB: Something that everyone seems to notice about Tawna Hill Baby products is the lack of strong fragrances. There is definitely a pleasantly detectable “aroma” when you open a container, but not a loud, pervasive, olfactory invader. What gives your products their delicate bouquets? And why did you choose such subtle scents? Tawna: It was important to me when creating the products that the smell be clean, natural and soft. I find some natural products to be just too “natural “ smelling, I know that sounds funny, but some are way too obvious with lavender, eucalyptus, calendula etc… I didn’t want my little girl to smell like a lavender bush – babies should smell delicious! Therefore, with Tawna Hill Baby we created a signature essential oil blend of Roman Camomile, Lavender, Neroli and Vanilla which creates a soft delicate smell, the results of which are also calming and soothing on the skin. FAB: Two of your products that we particularly love are the Super Smoothie Cream and the Comfy Soft Talc-Free Powder. Both are incredibly soft and delightfully pleasant to touch and feel. Can you talk a little about the importance of this quality in cosmetics for babies and why you chose to focus on the soft and smooth? Tawna: Quality is of the utmost importance when you think of how delicate a baby’s skin is; you really need to consider products that deliver a sense of ease in both application and results. I believe babies should be soft and smooth not sticky! The experience of applying our products on your baby should be of sensory enjoyment, ease and satisfaction for both parent and baby. I believe that we have achieved this, not only with our Super Smoothie Cream and Comfy Soft Talc-Free Powder but with all of our products. FAB: For all those mama’s out there who might be curious about balancing a new baby, a really scary health experience, and a new and booming business, can you tell us a little about your experience developing your company and being a mom at the same time? Do you have any advice for those of us who might aspire to something similar?